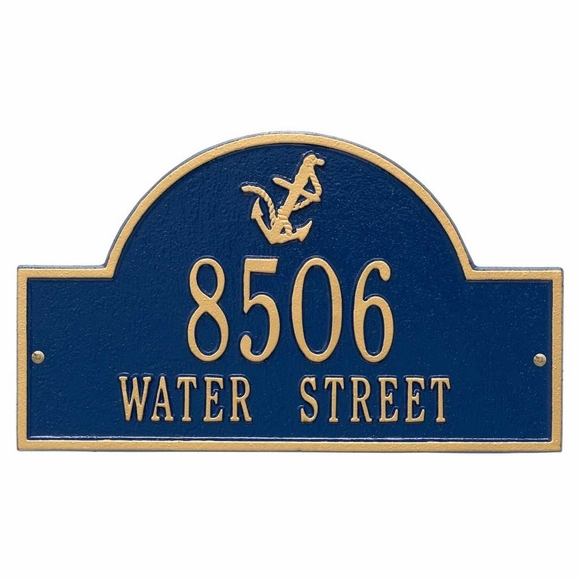 Personalized Anchor Arch Home Address Plaque - - 15.75" x 9.25" home address contains either one or two lines of personalization. Decorative anchor at the top of the sign broadcasts your love of sailing. The Whitehall Anchor Arch is available for wall mount or lawn mount. The one-line version holds up to five 3" numbers OR seventeen 1.25" characters (including spaces). The two-line version holds up to five 3" numbers on line 1 and up to seventeen 1.25" characters (including spaces) on line 2. If you are purchasing a one-line sign, please the Line 2 input box empty. Color combinations: dark blue with gold (large image), dark blue with white, black with gold, bronze with gold. Small images shown in this order: blue/white, black/gold, bronze/gold. I wanted a unique gift for my sons airbnb cottage. The plaque I viewed was customized to fit the name and location. Love it! He loves it!